Milwaukee, WI — World-class artist David Middlebrook is giving Riverwest a new landmark: a spectacular sculpture in Gordon Park. The arch-shaped sculpture will be installed at the entryway to the park, facing the southeast corner of the Humboldt Boulevard and Locust Street intersection. The arch marks the beginning of the new Beerline Trail and will be visible to thousands of commuters each day. Middlebrook was selected by a judging panel consisting of residents, artists, county engineers and architects, and County Supervisors Willie Johnson, Jr., and Penny Podell. The Los Gatos, California, artist impressed the panel with his knowledge of materials and ability to blend the artistic with the historical to create an abstract work with literal elements. The selection of Middlebrook’s proposal was unanimous. The sculpture is funded by Milwaukee County, which set aside a percentage of the cost for rebuilding Gordon Park (over $2.5 million dollars) to incorporate a $50,000 work of art in the park. “Technically and aesthetically, this is probably the most challenging work I’ve done,” Middlebrook says of the piece. He spent 18 months designing it, and in fact he and his wife were recently married under the arch. A celebration and reception for the artist will be held Monday, June 21, from 6:30 to 8:30 p.m. at the Art Bar, 722 E. Burleigh. Installation of the piece also begins June 21 and is expected to be completed in time for the neighborhood Fourth of July celebration at Gordon Park on July 5. 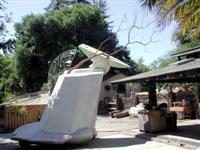 Elements of the sculpture are being shipped by truck from California, and a crane will be used to complete the installation process. The finished piece weighs 20 tons and is in 10 sections, with the heaviest piece at 5 tons. “Middlebrook has put his heart and soul into this piece,” said Vince Bushell, who has served as an unofficial liason with Middlebrook on behalf of the neighborhood and county. “The costs exceeded the grant, particularly the costs of shipping from California which are currently very high.” CG Schmidt Construction is providing labor, equipment, and materials for the installation. “We are grateful that this company stepped forward to donate the elements for the base which are necessary to complete this vibrant work of public art,” said Bushell. Sculpture Description A Los Gatos Weekly-Times feature on the sculpture notes that “at first glance, the sculpture may look a bit disjointed. A tree branch and an anvil sit atop a towering marble iceberg. The tip of the branch just barely touches a framework of cultural icons perched above a stone column bearing giant thumbprints.” Middlebrook says the sculpture represents the city of Milwaukee and its people over time. The natural environment is symbolized by the Italian white marble base, which represents the city’s geologic past and the glaciers that sculpted the landscape, including the moraines that form the river valley. Embedded in the glacier are symbols of Milwaukee’s industrial and commercial past and present. This represents the work and workers that built this city. They are also represented in the soaring bronze element that links the piece to the basalt column, which is embossed with enlarged fingerprints of today’s neighbors from ethnically mixed Riverwest. Continued Investment in Riverwest Green Space In addition to the $2.5 million spent on the rejuvenation of Gordon Park, another several million more dollars of federal and state grant dollars have been spent or dedicated to the acquisition of land or easements for trails and bike/pedestrian bridges that lead into the Milwaukee River valley. Other recent investments include an acquisition by the City of land along the old Beerline Railroad from Burleigh to Keefe through a CMAQ. Riverwest also recently celebrated the grand opening of Snail’s Crossing, a neighborhood-created park that came into existence thanks to an extensive collaboration between city officials, neighbors, non-profit organizations, individual donors, and Milwaukee Arts Board funding. The Riverwest Neighborhood Association (RNA) is a neighborhood group that is active in local greenspace and development issues. CG Schmidt Construction is a supporter of the River Revitalization Foundation (RRF), which has purchased land for preservation and access along the Beerline Trail south of Gordon Park.